The Academy has added remote evaluation events in southern California, south Florida, Dallas, and Houston, in addition to open houses and early audition sessions in Arizona and Las Vegas. The Battalion plans to field the corps’ first cymbal line in 2017. Want to know how and where you can watch the very first episode of the “Clash of the Corps” documentary series featuring the Blue Devils and Cadets on the Fuse Network? The Blue Devils have you covered with this informational page. Follow the Blue Knights on Snapchat and get a sneak peek at what the corps' design staff is up to this weekend. Michael Shapiro will return to the Blue Stars to serve as color guard designer and artistic director. "The relationship and collaborative process Michael has established with the Blue Stars over the past 10 years has been an absolutely essential component of the corps' success," Executive Director Brad Furlano said. Bluecoats is running a fall sale at its online store that includes discounts on the corps’ latest “Down Side Up” merchandise. Boston Crusaders announced the newest members of its visual design team for 2017. Here’s how you can save 30 percent on Cadets, Cadets2, and Vic Firth gear online. 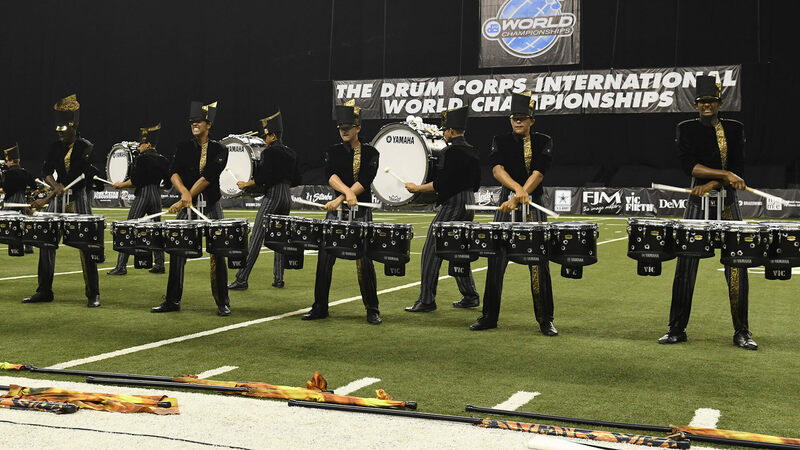 The Carolina Crown percussion section will perform this November at the Percussive Arts Society International Convention in Indianapolis. An age-out member of Colts who also serves as drum major with British drum corps, the Company, won the Drum Corps Europe Championship this past weekend in the Netherlands. Your donation to the Crossmen’s new trailer capital campaign can score you a limited edition color-changing Crossmen mug. Former Genesis members should sign up here to get the latest information on alumni events, fundraisers and gatherings. Patricia Islas and Doug Bush are two of the newest members of the Guardians’ percussion staff. Jersey Surf posted audition information for prospective 2017 members. Audition registration information is now available for prospective members of the 2017 Madison Scouts. Interest forms for prospective 2017 corps members to fill out are available on Music City’s website. Oregon Crusaders announced the members of the corps’ 2017 brass instructional team. A Pacific Crest trumpet player encapsulated his entire 80-day 2016 summer tour with the corps in this 90-second video. Phantom Regiment will hold its 2017 auditions in Rockford, Dallas, Atlanta and Southern California. Santa Clara Vanguard asks, “Anyone in the market for a giant metal tree?” A wide variety of costumes, equipment, flags, and other props are also available from various SCV, Vanguard Cadets, and winter guard and percussion shows from the past several years. The Spartans Winter Guard is recruiting performers to join the ensemble for its inaugural season. Troopers named the members of its 2017 color guard instructional staff.